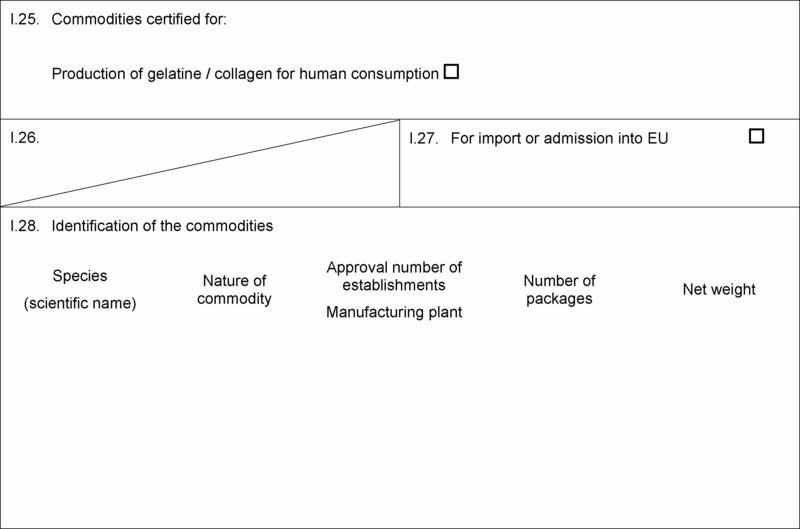 (viii) amino acids that are authorised as food additives in accordance with Regulation (EC) No 1333/2008 of the European Parliament and of the Council ( 1 ). 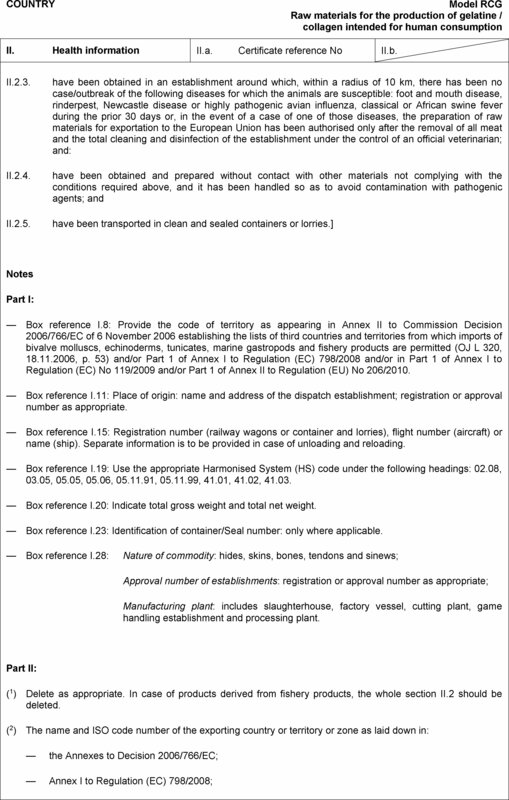 (viii) amino acids that are authorised as food additives in accordance with Regulation (EC) No 1333/2008. 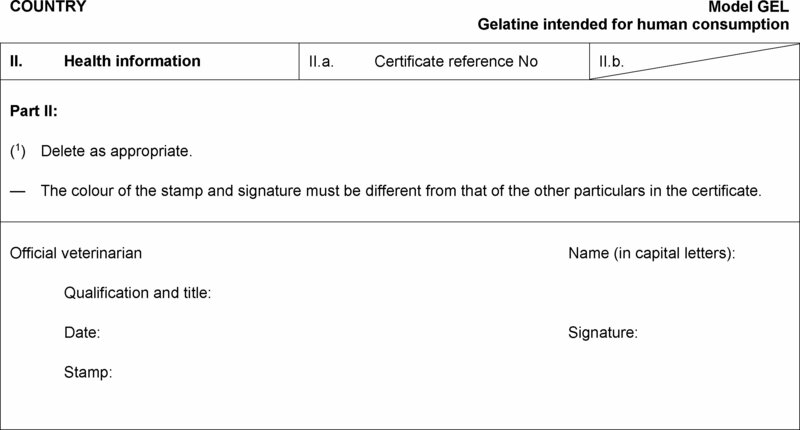 Those certificates must be completed in accordance with the explanatory notes set out in Annex IV and the notes in the relevant certificate. 2. Electronic certification and other systems agreed between the Union and the third country concerned may be used. 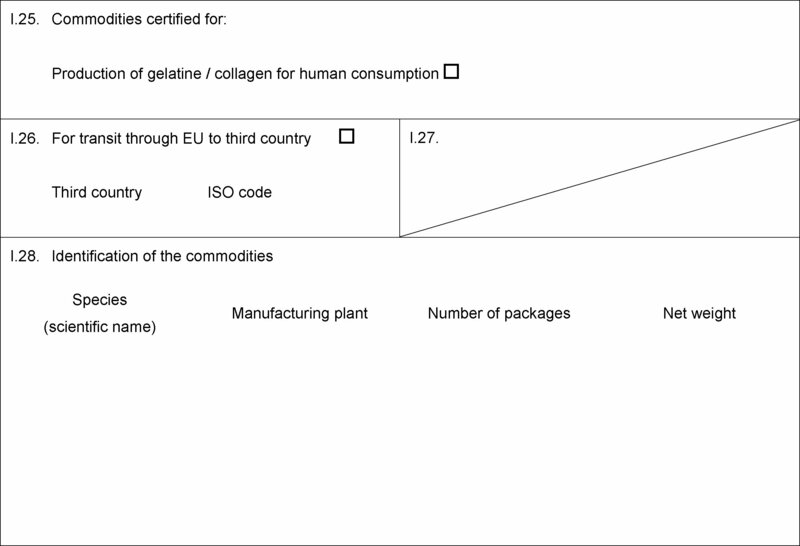 The third countries, parts of third countries and territories from which Member States are to authorise the transit through the Union of raw materials and treated raw materials for the production of gelatine and collagen intended for human consumption bound for a third country, either by immediate transit or after storage in the Union in accordance with Article 12(4) and Article 13 of Council Directive 97/78/EC ( 2 ), are set out in Parts IV and V of Annex I to this Regulation, respectively. 1. The model certificate for the transit through the Union of the raw materials and treated raw materials referred to in Article 3 is set out in Annex III. That certificate must be completed in accordance with the notes set out in Annex IV and in the relevant model certificate. 2. Electronic certification and other systems harmonised at Union level may be used. 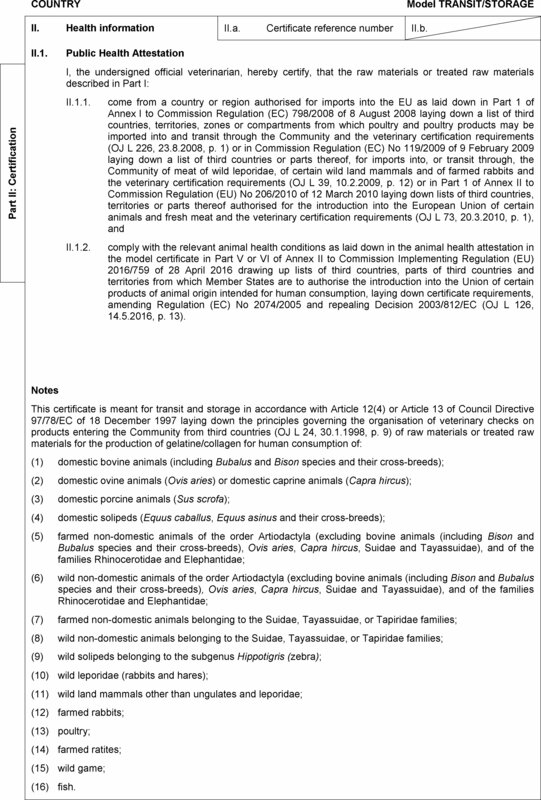 (d) the consignment is certified as acceptable for transit on the common veterinary entry document issued by the official veterinarian at the border inspection post of entry. 2. 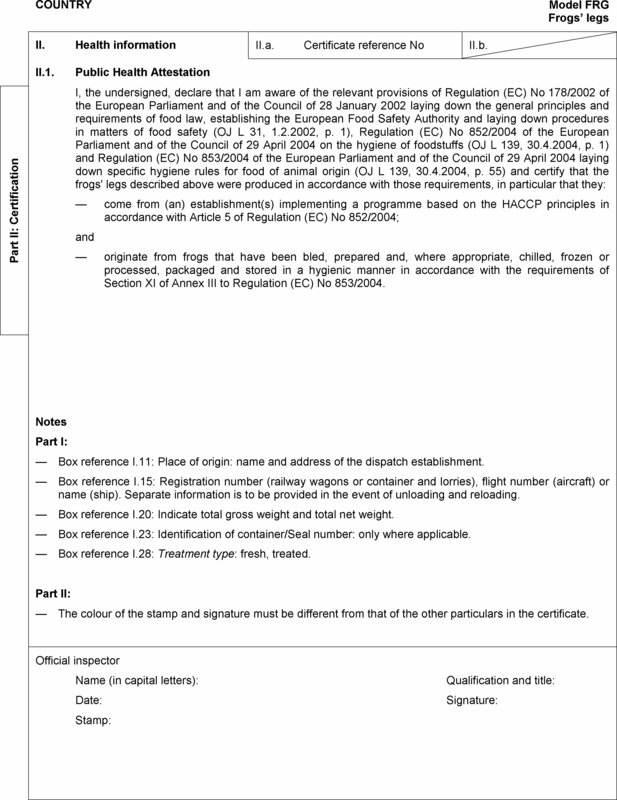 The consignments referred to in paragraph 1 shall not be unloaded or put into storage, as referred to in Article 12(4) or in Article 13 of Directive 97/78/EC, within the Union. 3. Regular audits shall be conducted by the competent authority to ensure that the number of consignments referred to in paragraph 1 and the corresponding quantities of products leaving the Union correspond with the number and quantities which have been introduced in the Union. (2) Appendices I, II, III and VI are deleted. 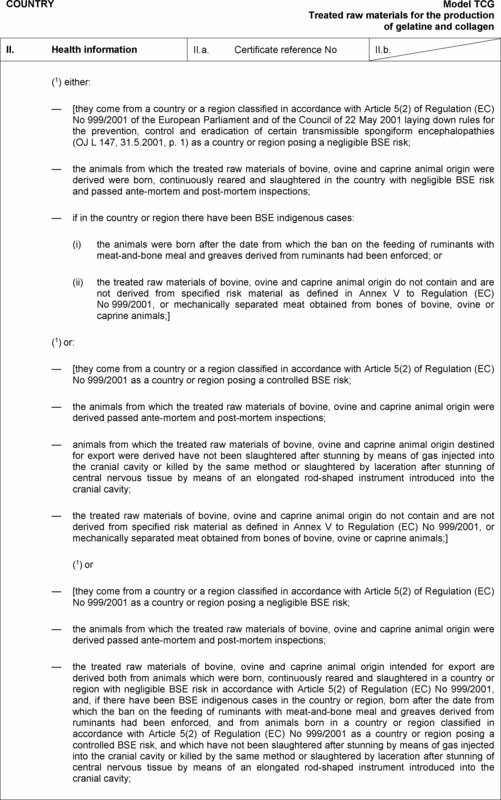 Consignments of products of animal origin in respect of which the relevant certificates have been issued in accordance with Regulation (EC) No 2074/2005 may continue to be introduced into the Union provided that the certificate was signed before 3 December 2016. (1) The former Yugoslav Republic of Macedonia; provisional code that does not prejudge in any way the definitive nomenclature for this country, which will be agreed following the conclusion of negotiations currently taking place on this subject in the United Nations. 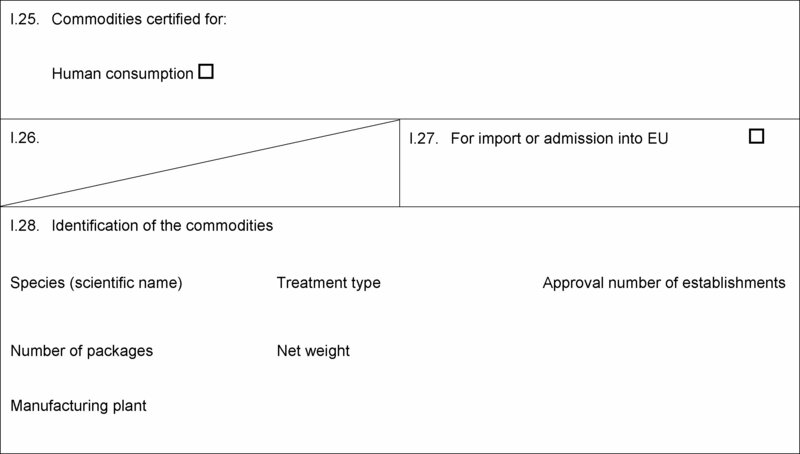 All third countries and territories listed in the column ‘Countries’ of Annex II to Decision 2006/766/EC, regardless of whether a restriction is mentioned in the column ‘Restrictions’ of that Annex. 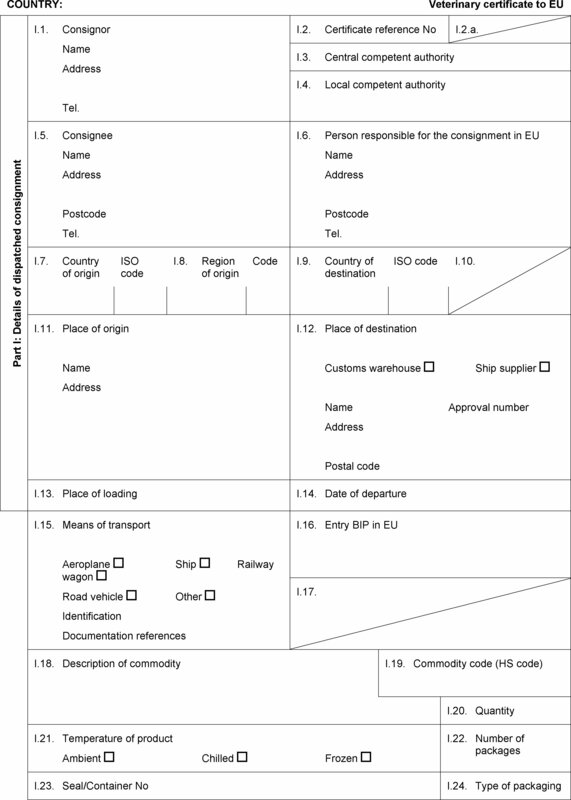 Third countries listed in column 1 of Part 1 of Annex I to Regulation (EC) No 119/2009. 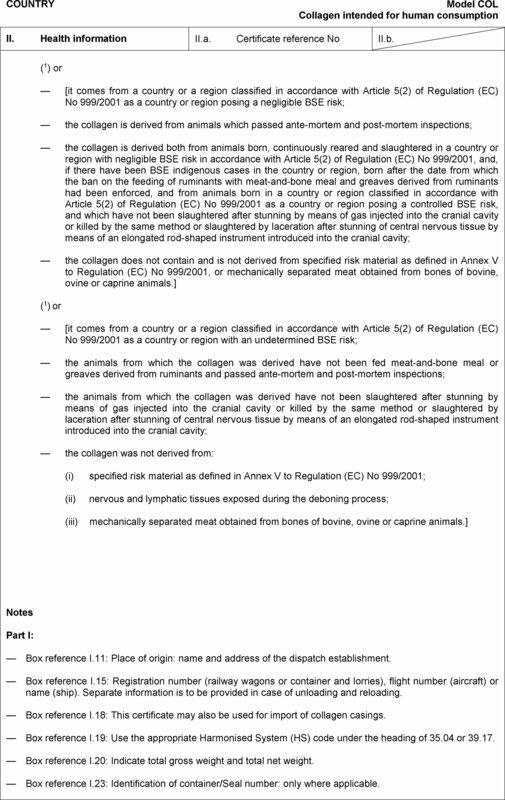 Third countries, territories and parts thereof listed in Part 1 of Annex II to Regulation (EU) No 206/2010 from which introduction into the Union of that category of fresh meat of the respective species is authorised as specified in that Part of that Annex, unless such introduction is limited by supplementary guarantees A or F as indicated in column 5. 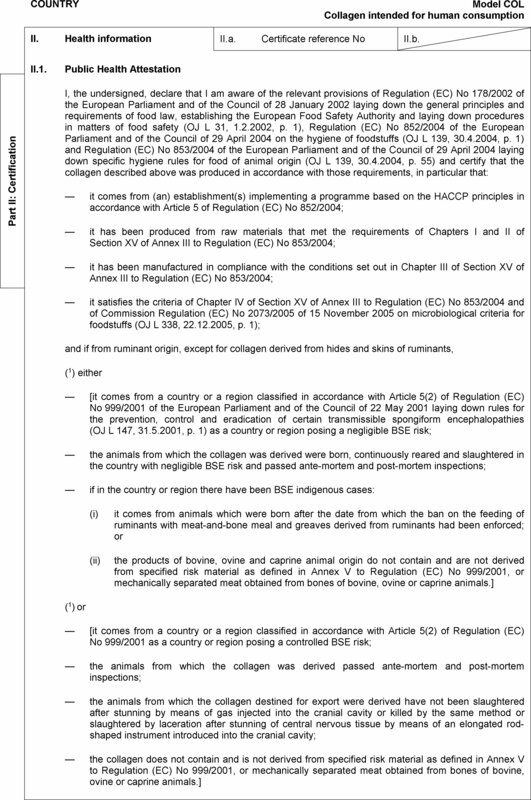 Third countries, parts of third countries and territories listed in Part 1 of Annex I to Regulation (EC) No 798/2008 from which imports of fresh poultry meat of the respective species is authorised as specified in that Part of that Annex. 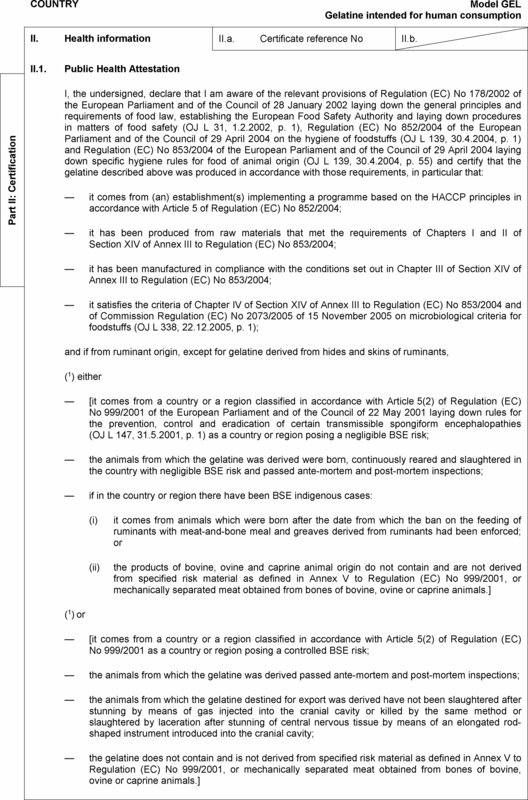 Third countries and territories listed in the column ‘Countries’ of Annex II to Decision 2006/766/EC, subject to the restrictions mentioned in the column ‘Restrictions’ of that Annex. 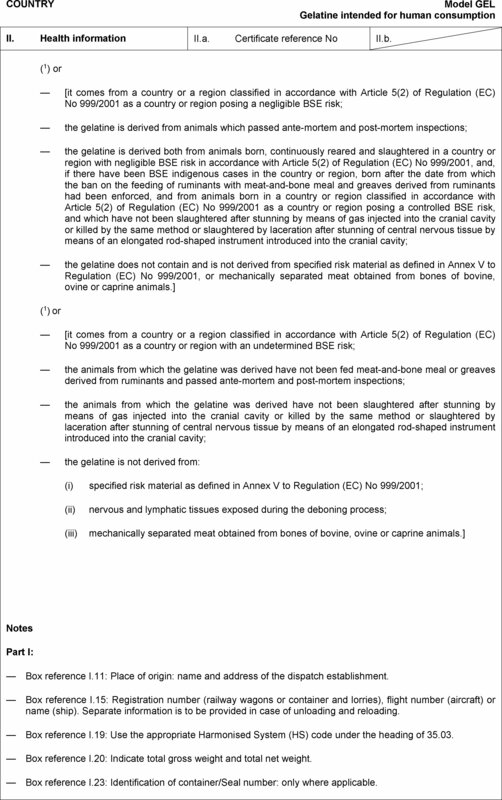 Third countries listed in column 1 of Part 1 of Annex I to Regulation (EC) No 119/2009 from which imports of fresh meat of the respective species is authorised as specified in that Part of that Annex. 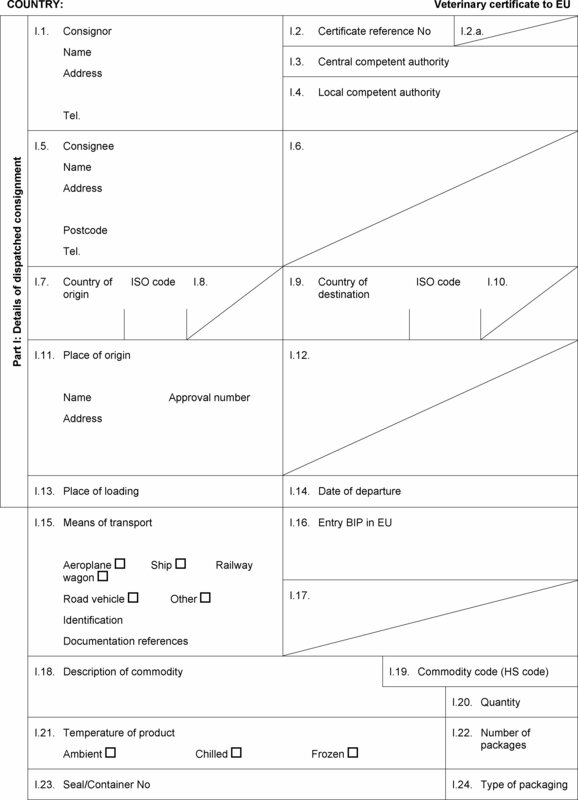 All third countries and territories listed in the column ‘Countries’ of Annex II to Decision 2006/766/EC regardless of whether a restriction is mentioned in the column ‘Restrictions’ of that Annex. Third countries, parts of third countries and territories referred to in Part IV of this Annex. 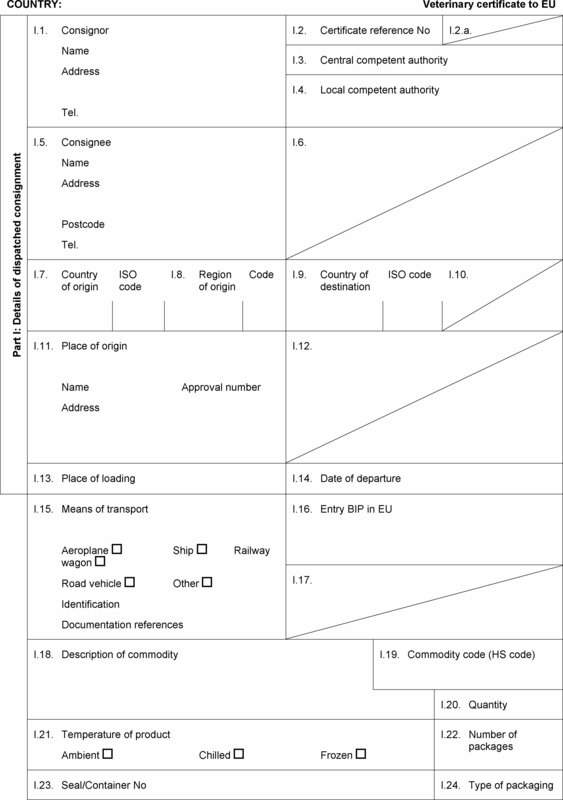 Third countries and territories listed in the column ‘Country’ in the Annex to Commission Decision 2011/163/EU ( 4 ) and marked with an ‘X’ in the column ‘Honey’ in that Annex. 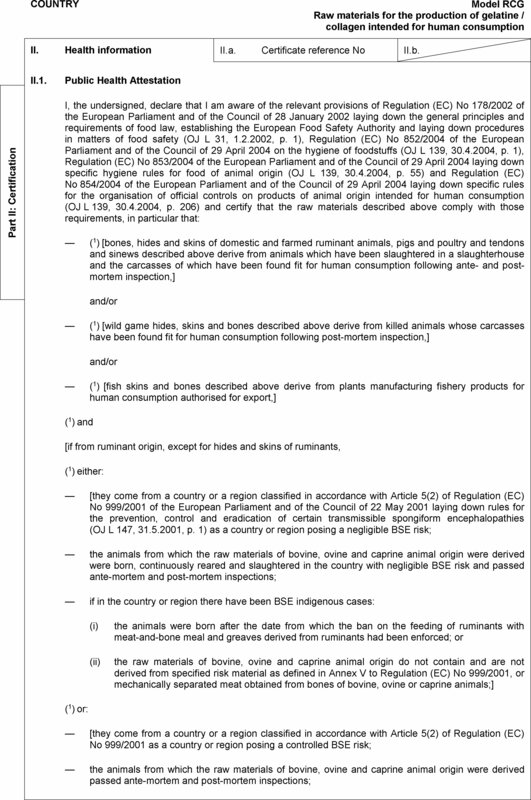 (b) In the case of the raw materials derived from fishery products, all third countries and territories listed in the column ‘Countries’ in Annex II to Decision 2006/766/EC, regardless of whether a restriction is mentioned in the column ‘Restrictions’ of that Annex. 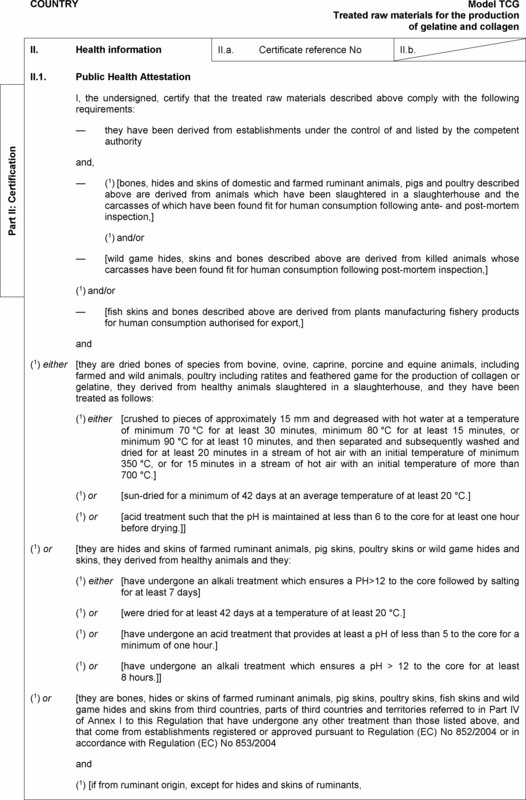 (c) In the case of raw materials derived from poultry, third countries and territories listed in column 1 of Part 1 of Annex I to Regulation (EC) No 798/2008. 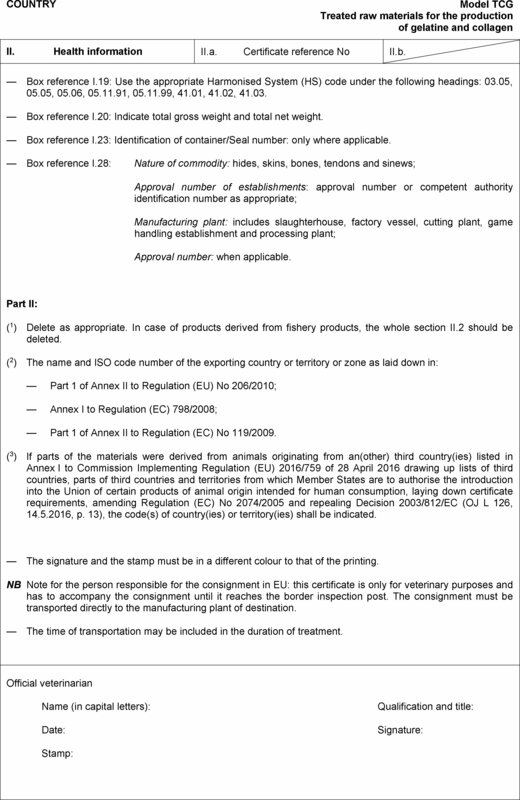 (a) Certificates shall be issued by the exporting third country, based on the models set out in Annexes II and III according to the layout of the model that corresponds to the products of animal origin concerned. They shall contain, in the numbered order that appears in the model, the attestations that are required for any third country and, as the case may be, those supplementary guarantees that are required for the exporting third country or part thereof. 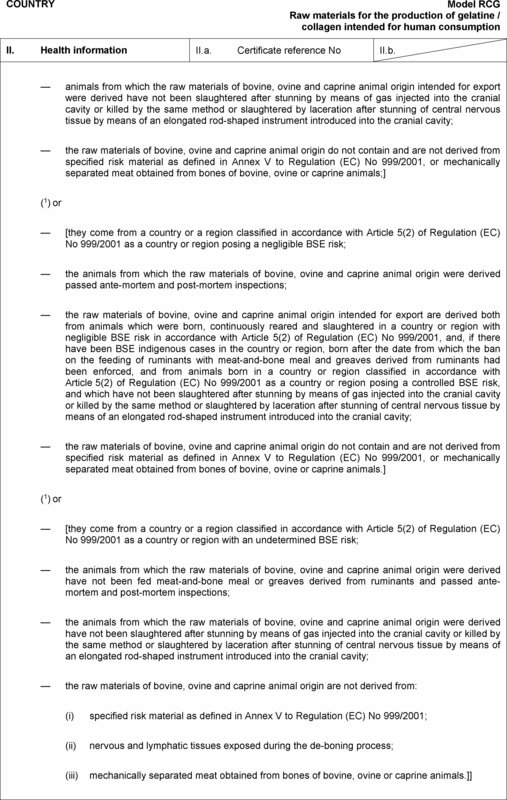 If the Member State of destination imposes, for the products of animal origin concerned, additional certification requirements, attestations to certify that those requirements are fulfilled shall also be incorporated in the original form of the certificate. 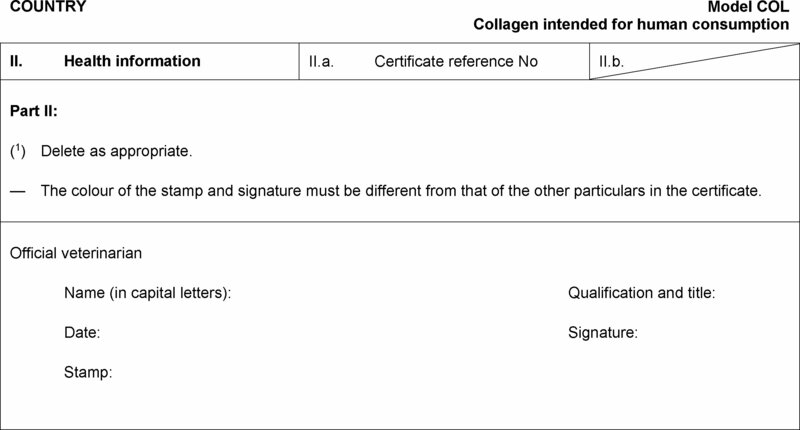 (b) Where the model certificate states that certain statements shall be kept as appropriate, statements which are not relevant, may be crossed out nd initialled and stamped by the certifying officer, or completely deleted from the certificate. 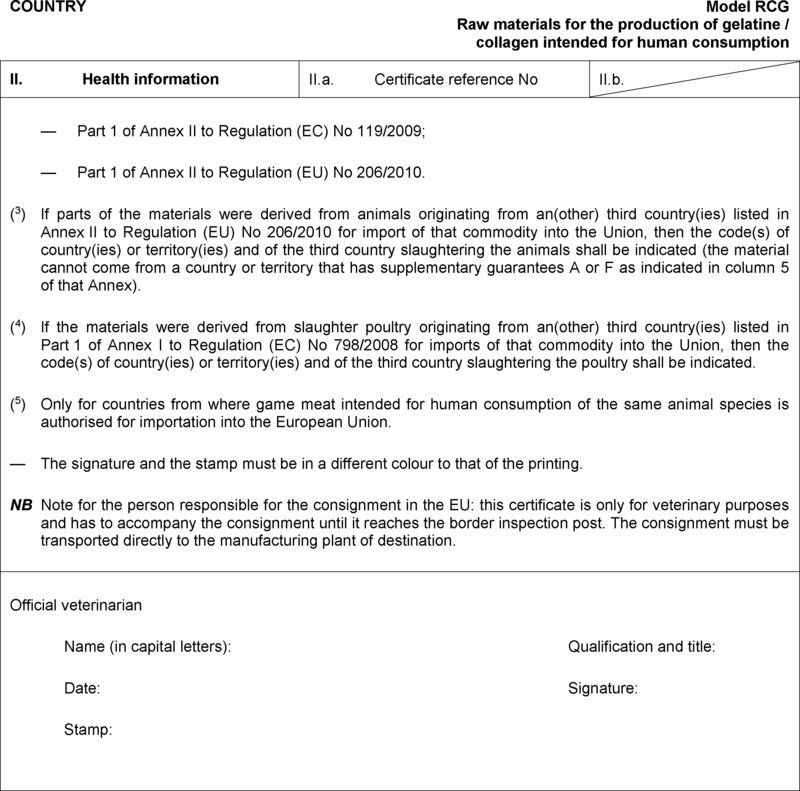 (c) A separate and unique certificate must be provided for the products of animal origin that are exported from a territory or territories or zone or zones of the same exporting country listed or referred to in Annex I which are consigned to the same destination and transported in the same railway wagon, lorry, aircraft or ship. (d) The original of each certificate shall consist of a single sheet of paper, or, where more text is required it must be in such a form that all sheets of paper required are part of an integrated whole and indivisible. (e) The certificate shall be drawn up in at least one of the official languages of the Member State of the border inspection post of entry of the consignment into the EU and of the Member State of destination. However, those Member States may authorise the certificate to be drawn up in the official language of another Member State, and accompanied, if necessary, by an official translation. 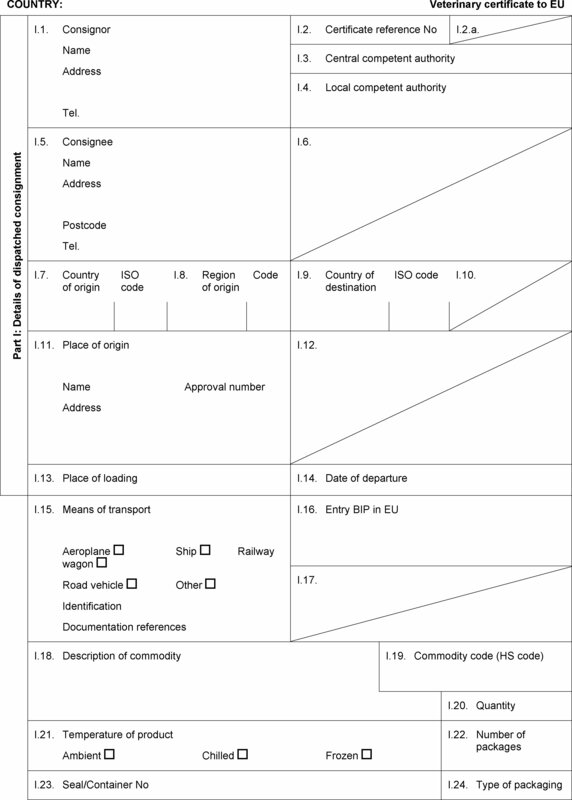 (f) If for reasons of identification of the items of the consignment (schedule in point I.28 of the model certificate), additional sheets of paper are attached to the certificate, those sheets of paper shall also be considered as forming part of the original of the certificate by the application of the signature and stamp of the certifying officer, on each of the pages. 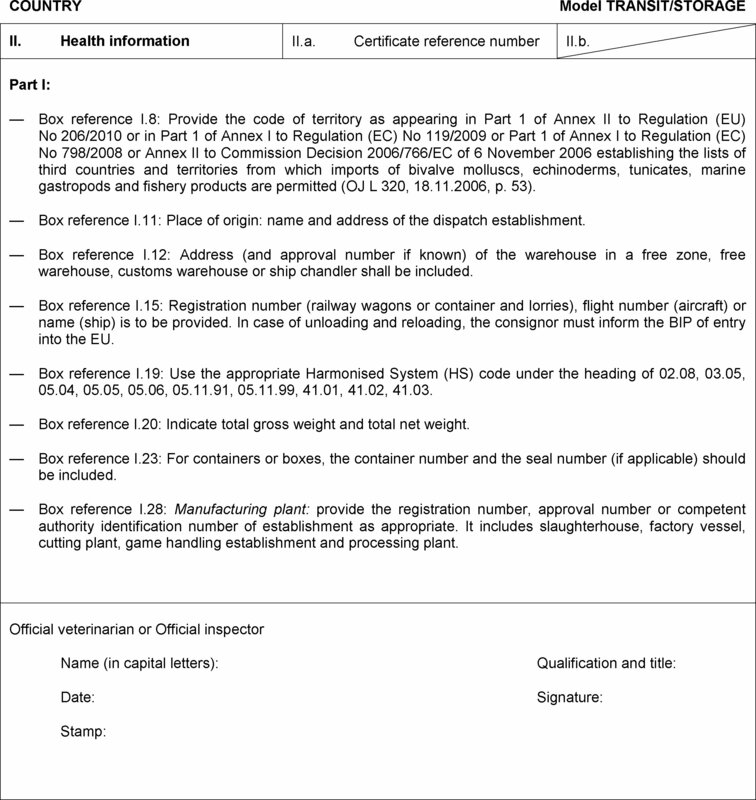 (g) When the certificate, including additional sheets of paper referred to in (f), comprises more than one page, each page shall be numbered, (page number) of (total number of pages), at the end of the page and shall bear the certificate reference number that has been designated by the competent authority at the top of the pages. 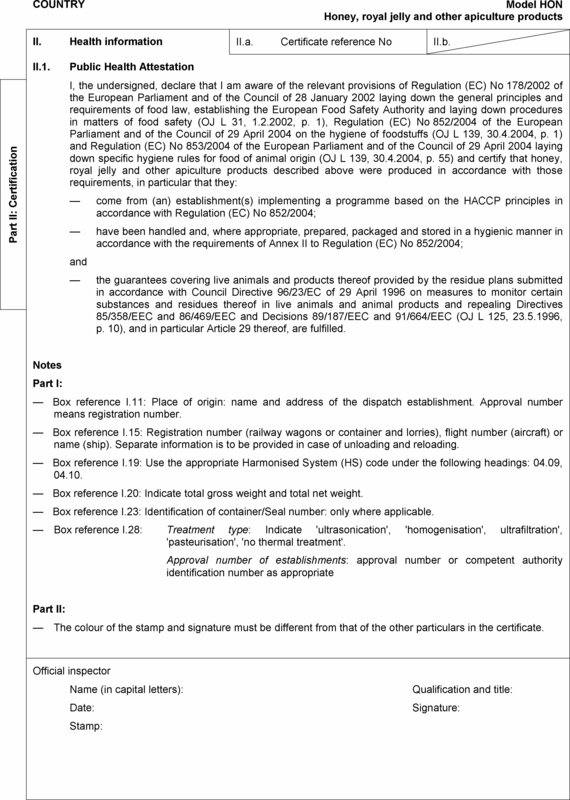 (h) The original of the certificate must be completed and signed by an official veterinarian or by another designated official inspector where this is provided for in the model certificate. The competent authorities of the exporting third country shall ensure that rules of certification equivalent to those laid down in Council Directive 96/93/EC ( 6 ) are followed. The colour of the signature shall be different from that of the printing. This requirement also applies to stamps other than those embossed or watermarked. 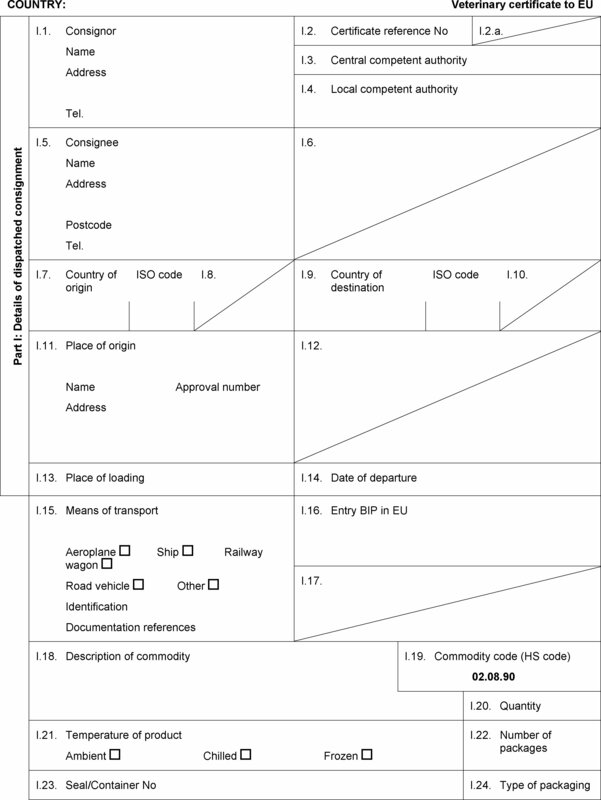 (i) The certificate reference number referred to in boxes I.2 and II.a. must be issued by the competent authority. 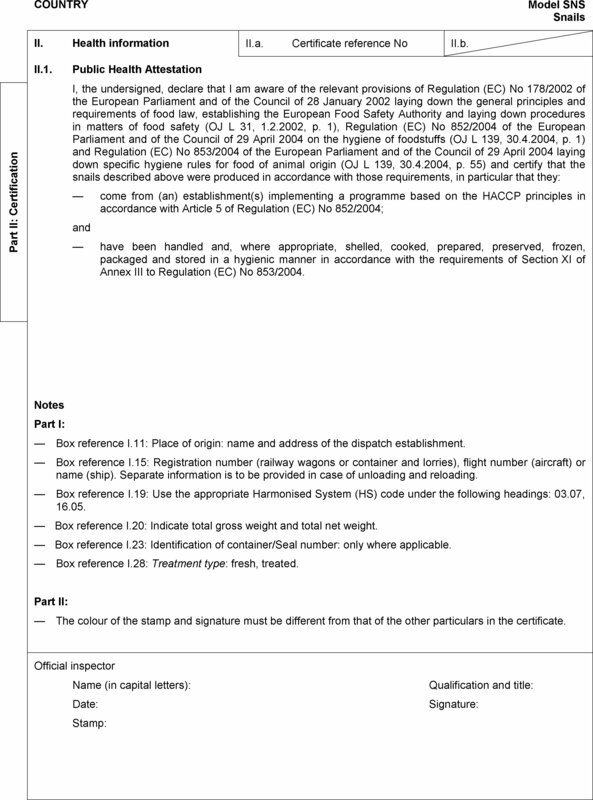 ( 1 ) Regulation (EC) No 1333/2008 of the European Parliament and of the Council of 16 December 2008 on food additives (OJ L 354, 31.12.2008, p. 16). 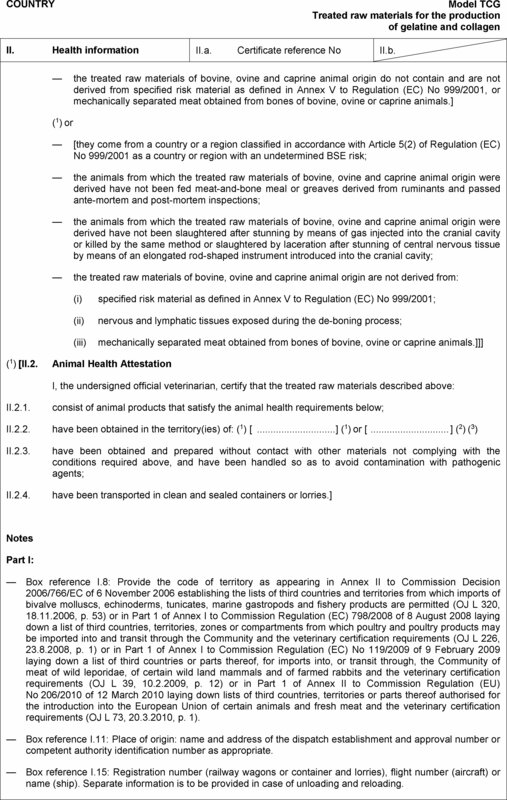 ( 2 ) Council Directive 97/78/EC of 18 December 1997 laying down the principles governing the organisation of veterinary checks on products entering the Community from third countries (OJ L 24, 30.1.1998, p. 9). 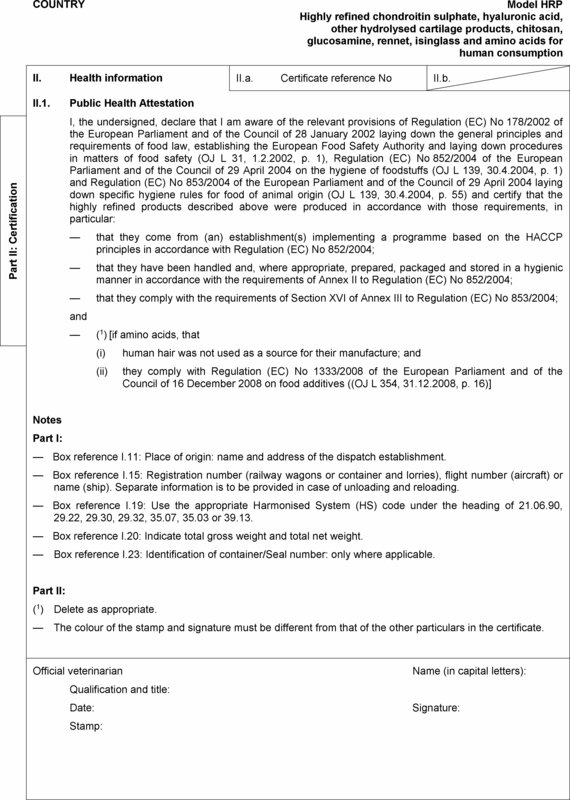 ( 3 ) Commission Decision 2009/821/EC of 28 September 2009 drawing up a list of approved border inspection posts, laying down certain rules on the inspections carried out by Commission veterinary experts and laying down the veterinary units in Traces (OJ L 296, 12.11.2009, p. 1). ( 4 ) Commission Decision 2011/163/EU of 16 March 2011 on the approval of plans submitted by third countries in accordance with Article 29 of Council Directive 96/23/EC (OJ L 70, 17.3.2011, p. 40). ( 5 ) Unless covered by Part VI. 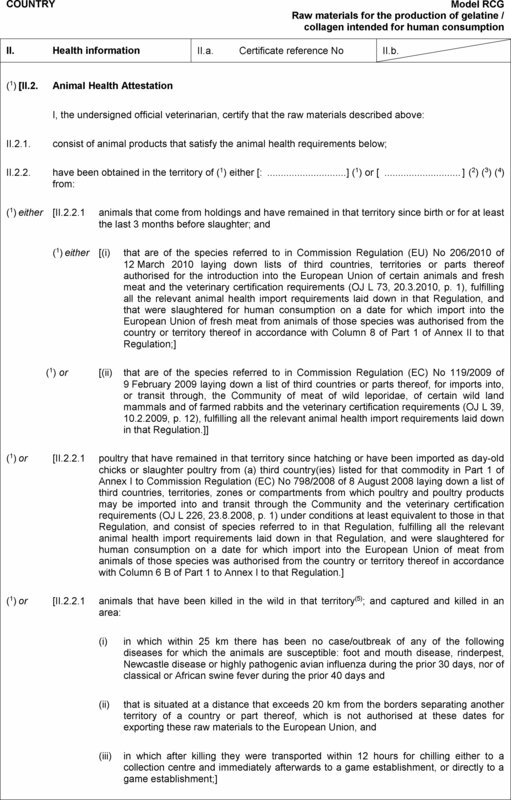 ( 6 ) Council Directive 96/93/EC of 17 December 1996 on the certification of animals and animal products (OJ L 13, 16.1.1997, p. 28).